Vocal Alchemy's 2015-2016 season included three concerts. A Canadian Christmas, Lux Aeterna, and Beauty Knows No Discord. 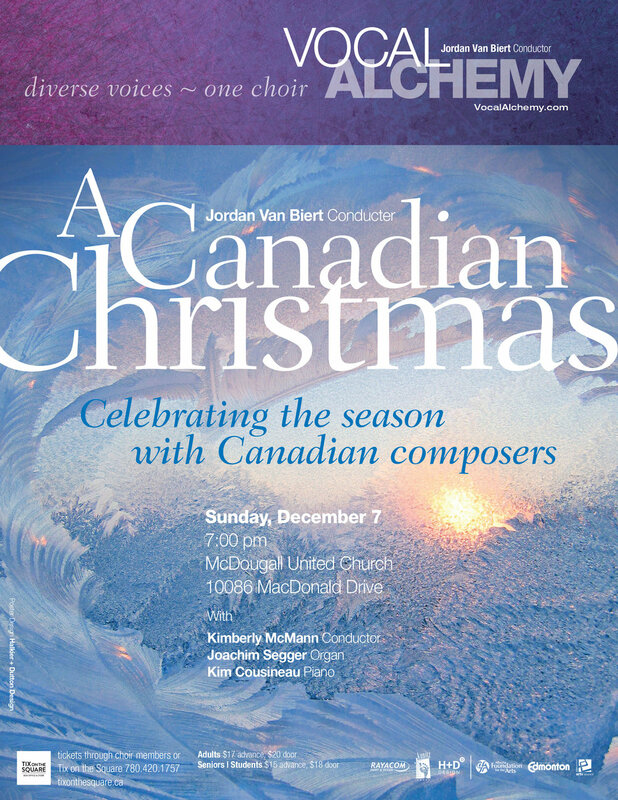 Vocal Alchemy celebrated the Christmas season with a concert featuring music by Canadian composers, organist Joachim Segger, and caroling. Featured works included the music of Mark Sirett, Healy Willan, Ivo Antognini, Jon Washburn, Stephen Chatman and many others. Guest organist Joachim Segger performed improvisations on familiar carols. Vocal Alchemy presented an evening of brilliant music, including works by Morten Lauridsen, Eric Whitacre, Ola Gjeilo, and others, and were joined by Chronos Vocal Ensemble and chamber orchestra. Sacred works, mostly by contemporary North American composers written around the theme of Light, were featured on the program alongside Morten Lauridsen’s Lux Aeterna. The program also featured Vocal Alchemy’s principal accompanist, Kim Cousineau, at the piano. Vocal Alchemy’s diversity shone through in this evening of musical settings of beautiful poetry, in the final concert of the 2014-2015 season. In an eclectic program, we performed music ranging from the Renaissance period through to 2014. The concert included classical, folk, jazz and pop music with pieces composed by Eric Whitacre, Morten Lauridsen, George Shearing, Stephen Chatman, and many others. Choral Assistant Kimberley McMann, conducted several pieces, and pianist Kim Cousineau.